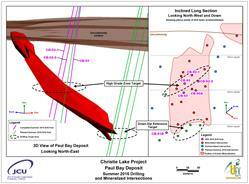 VANCOUVER, BC--(Marketwired - July 11, 2016) - UEX Corporation (TSX: UEX) ("UEX" or the "Company") is pleased to announce the radiometric results of drill holes CB-092-2 and CB-093 targeting the Paul Bay Deposit (see Figure 1) at the Christie Lake Project (the "Project"), where UEX has a $2.75 million drill program which is currently underway. The Project is owned 10% by UEX and 90% by JCU (Canada) Exploration Company Limited ("JCU"). UEX holds an option to earn up to a 70% interest in the Project. Radiometric Equivalent Grades ("REGs" or "eU3O8") from down-hole probe results from hole CB-093 encountered multiple mineralized intervals, the best of which returned 1.16% eU3O8 over 5.9 m (from 491.75 - 497.65 m) and included a section that averaged 3.45% eU3O8 over 1.3 m.
Hole CB-092-2 also encountered multiple mineralized zones within the hole. REGs from down-hole probe results returned 1.17% eU3O8 over 1.5 m (from 512.75 - 514.25 m), including a subinterval of 1.57% eU3O8 over 1.0 m.
UEX (TSX: UEX) (OTC PINK: UEXCF) (FRANKFURT: UXO) is a Canadian uranium exploration and development company involved in sixteen uranium projects, including four that are 100% owned and operated by UEX, one joint venture with AREVA that is operated by UEX, as well as nine joint ventures with AREVA, one joint venture with AREVA and JCU (Canada) Exploration Company Limited, which are operated by AREVA, and one project (Christie Lake) under option from JCU (Canada) Exploration Company Limited and operated by UEX. The sixteen projects are located in the eastern, western and northern perimeters of the Athabasca Basin, the world's richest uranium belt, which in 2015 accounted for approximately 22% of the global primary uranium production. UEX is currently advancing several uranium deposits in the Athabasca Basin which include the Christie Lake deposits, the Kianna, Anne, Colette and 58B deposits at its currently 49.1%-owned Shea Creek Project and the Horseshoe, Raven and West Bear deposits located at its 100%-owned Hidden Bay Project. This news release may contain statements that constitute "forward-looking information" for the purposes of Canadian securities laws. Such statements are based on UEX's current expectations, estimates, forecasts and projections. Such forward-looking information includes statements regarding UEX's mineral resource and mineral reserve estimates, outlook for our future operations, plans and timing for exploration activities, and other expectations, intentions and plans that are not historical fact. The words "estimates", "projects", "expects", "intends", "believes", "plans", "will", "may", or their negatives or other comparable words and phrases are intended to identify forward-looking information. Such forward-looking information is based on certain factors and assumptions and is subject to risks, uncertainties and other factors that could cause actual results to differ materially from future results expressed or implied by such forward-looking information. Important factors that could cause actual results to differ materially from UEX's expectations include uncertainties relating to interpretation of drill results and geology, additional drilling results, continuity and grade of deposits, participation in joint ventures, reliance on other companies as operators, public acceptance of uranium as an energy source, fluctuations in uranium prices and currency exchange rates, changes in environmental and other laws affecting uranium exploration and mining, and other risks and uncertainties disclosed in UEX's Annual Information Form and other filings with the applicable Canadian securities commissions on SEDAR. Many of these factors are beyond the control of UEX. Consequently, all forward-looking information contained in this news release is qualified by this cautionary statement and there can be no assurance that actual results or developments anticipated by UEX will be realized. For the reasons set forth above, investors should not place undue reliance on such forward-looking information. Except as required by applicable law, UEX disclaims any intention or obligation to update or revise forward- looking information, whether as a result of new information, future events or otherwise.